You’ve already done all the groundwork and made sure your youngster is ready for backing - now you just need to actually, you know, get on! It’s an exciting moment when you sit on the back of a horse for the very first time and they accept you calmly and without question. Don’t plan to back your horse on a day where there’s a big jumping lesson going on, or at feed time when your horse will be distracted. If you usually work with them at certain times of day, stick to that. You want to minimise distractions and keep everything calm and focused. Because of this, it’s also probably best not to pick a day when it’s pouring with rain or unusually windy. This may mean that you have to be flexible with your plans or timeline, and that’s ok. The point is to always set your horse up to succeed when you sit on them for the very first time. If it’s possible, have a knowledgeable person on the ground with you when you climb aboard for the first time. 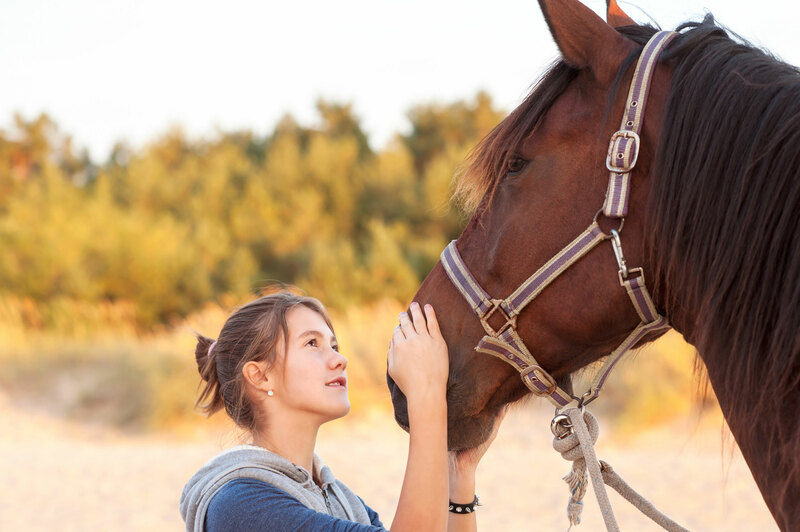 They can help to keep the horse calm, hold the horse while you get on, or even lunge them gently once you’re on if this is what the horse is most accustomed to. It’s also important from a safety perspective to have someone with you in case something goes wrong and you need help or medical attention. For your horse’s first time being mounted, it really is best to use a mounting block or something high that you can use to get on. It sounds obvious, but many people have attempted to get on for the first time with a less-than-smooth leg up and spooked the horse badly, making it far harder to get on the next time around! Now comes the crucial time of actually biting the bullet and getting on! You’ve probably done many of the preparation steps in terms of leaning over the horse and so on, but it’s wise to run through them again before you mount. Standing on the near side of your horse, reach over the barrel, drape your arms over his sides and squeeze and pat all over him. Stand up straight, remove your arms, and repeat this a few times – your horse should accept this without flinching or tightening his back up in response. Sweep your arms over his hindquarter where a leg might brush as someone was getting on and generally test that he is happy with touch in all areas. Next, you want to up the pressure a little. Start off by lying across the saddle on your stomach and keep slightly more weight over your feet than your head. Why? You want to be prepared to swing back on to your feet if your horse reacts badly (though he shouldn’t) rather than fall on to your head! Get off and do this three or four times. Part One: Is Your Young Horse Ready to be Backed? Once he’s happy with this, you can slowly, slowly swing your leg over and sit up in the saddle. Reward your horse with a soft voice and a scratch on the withers and stay at a halt until he is relaxed. 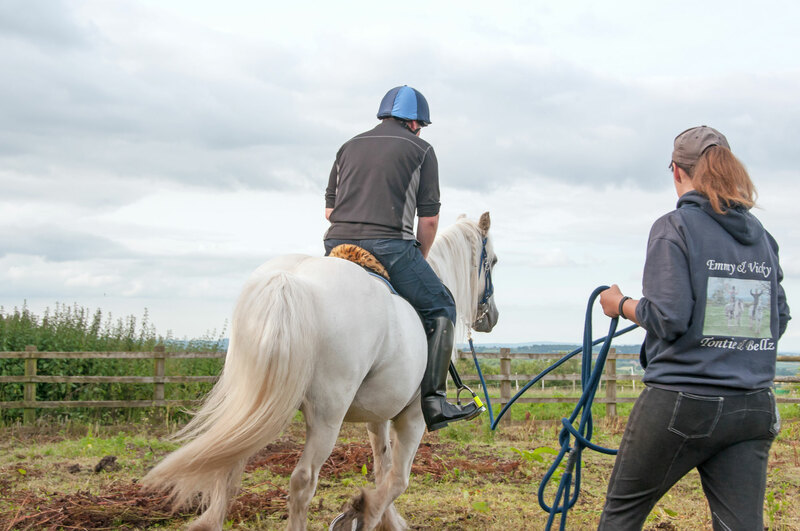 If you have someone on the ground, ask them to help lead the horse into walk when you want to move off. Throughout the entire process, you should be carefully monitoring your horse to see if he is showing any signs of distress or anxiety. Of course it's natural for a horse to be wary of what's going on, but if he is very worried and showing high tension or nervousness and you think there might be a bit too much pressure, don't be afraid to go back a step. This might simply mean that instead of swinging your leg over the saddle, you need to spend a few more minutes leaning over his back. If your horse is reacting badly then you can always leave the backing until another day, but make sure that you finish on a positive note with something the horse is comfortable with and finds easy to tolerate. So, what signs of tension should you look out for? A tight, raised back is an obvious sign and often indicates a horse who might explode or run off when you get on. Obviously, a horse who is backing up rapidly or spinning around when weight is placed in the stirrup or saddle is a horse who is feeling stressed out. A tight, clamped tail is another warning sign, as is a very elevated head and neck carriage with wide eyes - we've all seen the "crazy eye" before! If you do get on and the horse panics and bolts or bucks, try to stay calm and bring them to a stop without any pulling or yanking. A bad experience will make it much harder to complete the backing process with your horse's confidence intact - nevermind your own! However, this shouldn't happen if your preparation has been good and you've been keeping an eye on the horse's tension level. And there you have it - your young horse has officially carried a rider for the first time. Congratulations! Follow FEI.org for more great tips on horsemanship!